I am currently helping out on the Facebook Group” Communication, Visualisation and Prayers for the Dolphins in Taiji (Japan)” with some lovely people who are appalled at the way that the dolphins and whales are being hunted and tortured in Taiji Cove (See my previous blog on the conversation that I had with someone in the agricultural section when I phoned The Japanese Embassy ) Other people have called, emailed, protested oustide and written some brilliant letters to MPs etc. We are “tuning” in to the dolphins and whales to send them strength, energy and love and to try to urge them to move away from the Taiji Cove area. The problems are that these hunters are going 30 miles out to sea so the dolphins would need to go far away which they might find it hard to do because they are very social, family orientated creatures who do not like to leave their family. It seems that if a family member has been trapped and kept in the holding bays, other family members are unlikely to leave. So how can we influence or get messages to these creatures from a distance by using only visualisations and meditations. Well, I am now going to share something quite remarkable that I experienced many years ago. One of my friends had hooked up with a guy who captured two barn owls who he called Bart and Tart. I know, it is a travesty and against the lawI am sad to say that my friend was so easily influenced especially when in love. By the time I was aware of it, Tart had gone and only Bart remained. I saw Bart in a big tall cage that had been constructed for him in the back yard.I stood there and really looked into his large eyes and felt such a deep connection with him. I cut a small branch of a tree aand put it in his cage and in my own way, I told him that I would get him released. My friend said that her new boyfriend was coming back the next day and that I could speak to him then. I told her that I felt worried and exceedingly sad for the owl. That night I lay tossing and till the early hours. Now the point of this story is that I do not know which way round it is, whether I helped Bart by encouraging him to escape or whether I had formed a link with him and therefore was aware or connected to him as he freed himself. All I knew is that I could not sleep and I felt such torturous emotions, so much longing to be free that I visualised Bart or I might have been putting myself in his place, pushing and pulling at the wires of the cage to make a gap. I cannot explain how intense the experience was. It totally consumed me, engulfed my whole being and I could not think of anything else, except to get out of the prison and be free. Every fibre of my being was focussed on this. I must have eventually fallen asleep because I woke up, remembered the night’s agonising and carried on as I normally would. This is 100% true. I have absolutely no reason to lie and nothing to gain by doing so. My friend phoned me in a panic. Bart had escaped during the night through a hole that had been made in the wire cage. She had checked the side gate, it was locked and no one had been in and none of the neighbours had been into the back yard either. The thing was that the padlock was untouched, the door was still intact but there was a hole in the wire. She said that Bart must have made it himself and escaped. I was over the moon and totally shocked and mystified. I went to my friend’s to look at the cage and sure enough, there was a hole, a small one I must add and Bart had flown the coop. As I said previously, this is one of the many times in my life when I cannot say what happened. All I know is that I felt a huge overwhelming wave of compassion when I saw Bart, that I spent time looking deep into his eyes and telling him that I would help him be free, and that I spent the night “with” him, empathising with him, agonising with him to the point where I was not sure where he ended and I began and vice versa. I do not mind what the explanation is, he escaped that night, and somehow, through encouraging him or through experiencing his struggle through thought transference, a miracle happened and he was freed. This is why I have hope for the dolphins and whales. 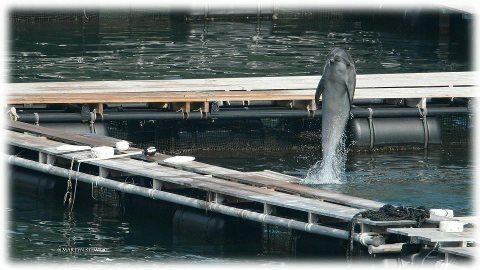 It has been told that some people tried to rescue the dolphins from Taiji before and they destroyed the nets but the dolphins did not try to escape. They did not move, but this could have been because of family members injured and they being social creatures could not find it in themselves to abandon them. Something else occurred to me. I had to look up the details but remembered hearing about the 100th Monkey effect (Wikipedia).Lyall Watson wrote a book in 1979 called “Lifetide” The claim is that unidentified scientists were studying a group of macaque monkeys, funnily enough on the island of Koshima which is a Japanese island in 1952.They allegedly witnessed that some of these monkeys learned to put sweet potatoes in the water and wash them. This new learned behavior slowly spread through the younger generation of monkeys as all behaviours do, through observation and repetition. But Watson then proposed that the researchers observed a very interesting phenomenon, that once a critical number of monkeys was reached—and the so-called hundredth monkey had learned to do this, which was the critical number of monkeys—this previously learned behaviour that had had to be learned through observation and imitation, in other words through being physically present to be shown how to do it,immediately spread across the water to monkeys on nearby islands! After 100 monkey had learned this behaviour through usual means, the acquired behaviour spread like a virus and other monkeys not present in time or space started doing the same!! This is an amazing phenomenon, that 100 monkeys was the critical mass point and after that it became learned behaviour of the species with no instruction. Time and space became irrelevent. So, I am thinking that supposing, just supposing we can reach 100 dolphins and tell them to keep away from the cove and to jump over barriers if they are trapped, then maybe it will become a natural trait for the species keep away from the area and jump for freedom when they spot an opportunity. We are not physically there but I know through many years of absent healing and through recentlybeing attuned to Reiki healing that we are all connected, that energy follows thought, that time and space in the sense that we have of them are just constructs. I have to return to Bart, the Owl. We established some kind of communication over distance there. The call from my friend showed me that. So with the Owl experience and the 100th Monkey effect encouraging me, I will continue to do meditaions and visulaisations for the Dolphins and Whales of Taiji Cove. This entry was posted in Animal Work, Dolphin, Reiki and Energy Work, SOW School Of Wyrdynamics, Taiji Cove and Related Information, Taiji Terror Tales and tagged animal communication, dolphin, monkey, owl, Taiji Cove and Related Information, visualisation. Bookmark the permalink.